On this day, in 1964, New York Yankees legendary slugger Mickey Mantle hit home runs as a left hander and as a right hander for the tenth and last time in his illustrious career as a Bronx Bomber (1951-68). Mantle's total of 10 Switch-Hit Homers in the same game was a Major League record but has since been surpassed ... with former Yankee Nick Swisher now holding the career mark with 13. 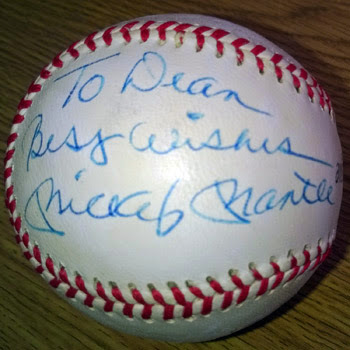 As well as putting bat to ball with alarming power, Mantle also put pen to ball, as witnessed by this clearly autographed Spalding baseball. "Hitting the ball was easy. Running around the bases was the hard part?"